How 2 Today | You can learn through making – Today! Solar cells convert light into electricity. Sunlight works really well with these photovoltaic cells, but other types of light work also. Halogen and Incandescent light works better than Fluorescent light with solar cells. Older solar cells were often polycrystalline, and the surface of those were usually blue. The newer ones don’t have the same visual texture, and have higher output. Usually, the darker surface of the cells is an indicator of higher amperage output from the cells. Solar panels can be wired in series to increase voltage, or wired in parallel to increase amperage. The garden lights have an interesting circuit. When you buy them in the store, they may turn on their LED when light hits the solar cells as they did for me. After you pull the tab out, and connect the battery to the circuit, they only light the LED when the solar cell is in the dark. Inside the housing of the walkway lantern is a small circuit board between the solar cell and the battery. This circuit keeps the LED from using up the electricity from the solar cell during the day, and when the input voltage falls below a threshold, the electricity stored in the battery is sent out to do the work of lighting the LED. It may be that the circuit has a voltage booster, since the 1.2 volts of a rechargeable battery is probably not enough to make an LED shine. Recently, the tool fairy brought me a consumer grade vinyl cutter.A feature that attracted me to this model is that it can cut paper. Making intricate cuts in paper is much easier with a tool like this, and much less expensive than with a laser cutter. The Silhouette Cameo is an interesting machine. It’s extremely affordable, and probably best for light personal use. As a classroom tool, it might not be durable enough. It definitely isn’t made for commercial use, but there appear to be plenty of things you can do with it. One of the traditional first projects that computer programmers do with a new language is to write a Hello World program. This is the easiest way to use the program and prove that everything is working. 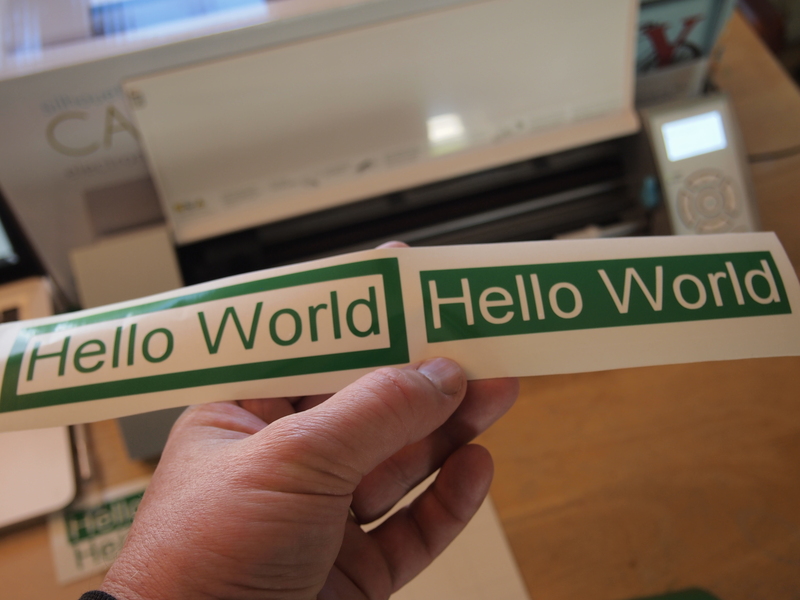 In this initial vinyl cutter project, I made several Hello World stickers, which can be weeded in a few different ways. The vinyl cutter acts a lot like a printer, in terms of computer hardware. It is a CNC tool, and cuts by moving a knife blade along three axes: Z is the blade moving up and down, Y is the material being rolled in and out of the machine, and X is the carriage moving side to side. Beyond the super basic Hello World vinyl you see here, there are some really amazing things you can make with this tool. You can cut pictures that you have drawn, photos that you have shot, make custom signs, make your own silkscreen stencils for T-shirts, and create circuit boards with the vinyl stickers. The Makey Makey controller is a lot of fun to use, since it allows you to create your own computer input devices out of the things you have available nearby. You plug the Makey Makey into the USB port on your computer, which sees it as a keyboard and a mouse. There are many things that you can create with this amazing tool. When I was showing it to a friend recently, I set it up so that when he took a drink from his cup, the computer would think that he clicked the mouse button, which sent a tweet. You can do a lot with the Makey Makey. 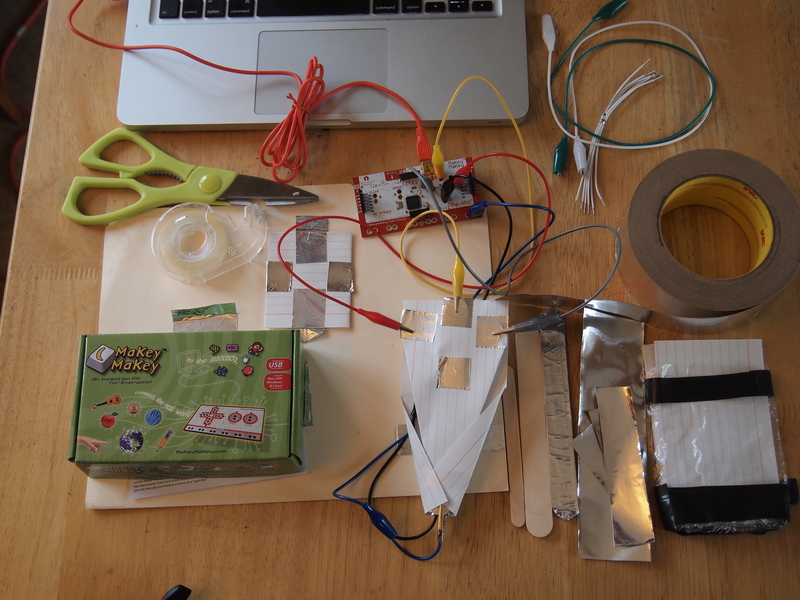 In this project, I made a few arrow controllers out of a file folder, some 3″x5″ cards, craft sticks and aluminum tape. The first idea I had turned out not to work as good as I originally thought it would, so I tried it again (a couple of times). It would be fun to create a game controller that is themed on the games a player might enjoy, or to make one that uses all of the controls built into the Makey Makey. Working with this controller in combination with writing computer programs would also open up a lot of really amazing options. 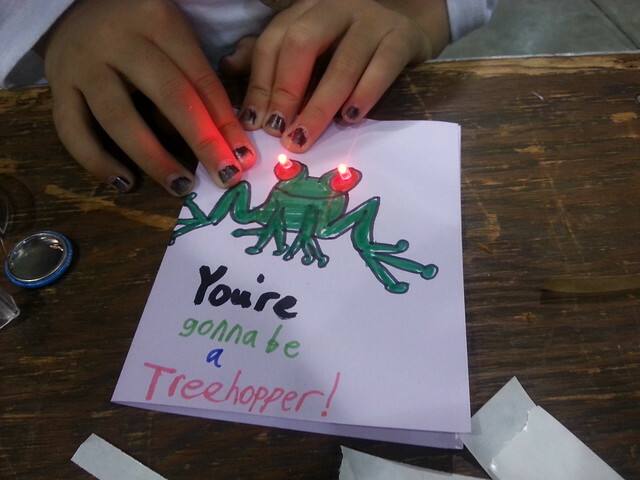 At Maker Faire, I had a chance to make TapeTricity Cards with a few hundred people. TapeTricity is quite possibly the simplest way to introduce electricity to people. THere were kids as young as three or four who made their own working circuits (the younger ones got some parental help). This project was fun, because people got a chance to make a drawing, which they then picked out some places for LEDs. Next, they built a simple circuit out of tape, batteries and LEDs. It is a fairly quick project, and costs about a quarter per person. Tamara from Brown Paper Tickets along with Windell and Lenore of Evil Mad Scientist Laboratories were helpful in supporting this workshop. Stomp rockets are a great way to introduce flight, pneumatics, and energy transfer through hands-on learning. Paper rockets are very easy to make, and use “virtually free” materials. 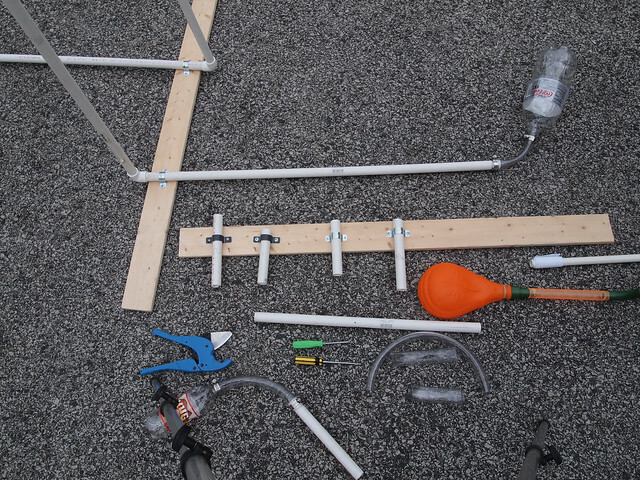 This will help encourage multiple iterations and exploration of rocket design. You should be able to focus on the important aspects of building and redesigning the rockets. The rockets themselves are very inexpensive, and there are lots of options for their redesign. I spent a few hours exploring the various supply options at a big box building supply store. Without knowing exactly what I would end up with, I brought a good collection of supplies to a local space to work it out. In the video above, you can see some of what worked, and a few things that might be good to avoid in building your own stomp rocket launcher. During an evening session, I built several launchers of a few different designs. Each of the designs is simpler than the one shown in the Instructable that I referenced. There are photos of this project. There are notes in the captions of the pictures, which may be helpful during the shopping and build sessions of the project. Recently, I helped out at the local library makerspace on a workshop for teens. We started with the BrushBots kit and project from Maker Shed. We used the BrushBots Party Pack, and then built CupBots with supplies that I had prepared beforehand. As we were getting started, many of the group set up accounts on the DIY.org website. The PHILS is an after school group that has been meeting at the library for a while, starting out as a philosophy discussion group. They are now exploring and demonstrating their philosophy with lots of hands-on learning. This week, they started building things that use electricity. 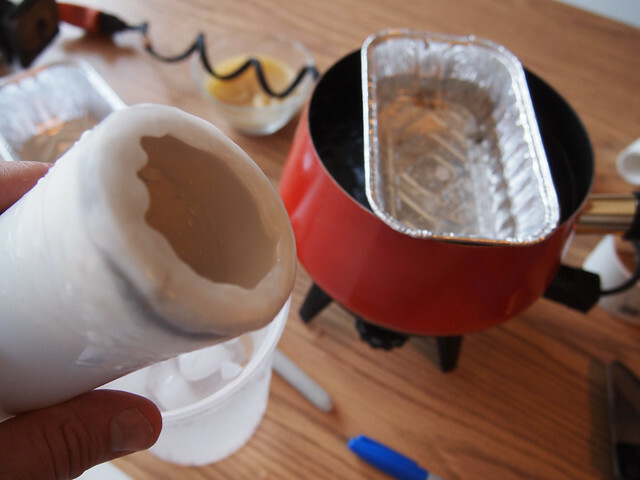 Check out Ellen’s blog post on the workshop. Working on a whiteboard was a good strategy. This provided a flat surface to work, and having it on the floor suited the teens well. As it turned out, this also provided a good place to share information about the project. As they were working, I was able to draw the schematic diagrams of the various circuits they were building on the whiteboard, which they could see without having to look away from their projects. I also brought along a small whiteboard on a stand, which seems to be a tray for eating and working. We tried making a little hockey rink, drawing goals and a center line. Several students made cardboard sticks to try out the game play of BrushBot Hockey. The trickiest part seemed to be stripping the wires without cutting them all the way through. There was a little trouble with some of the double stick tape getting dusty from the rug and not holding onto the brush or battery, but there was extra tape to be had by cutting some of the pieces from the kit into smaller pieces. As we were winding down from using the kit, I revealed the supplies for the CupBots. Earlier, I had soldered two wires to each motor, which made it easier to build the motor circuit. We used just a few supplies for each the BrushBot and CupBot project, and the tools were pretty simple as well. 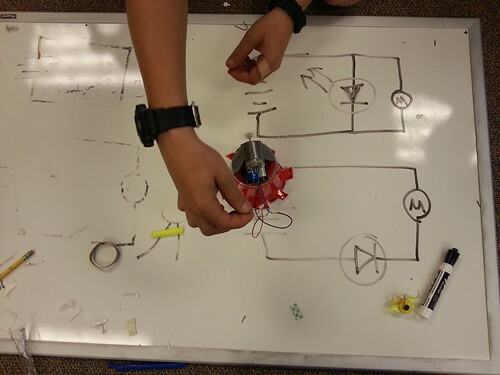 The CupBots have the same circuit, but larger components. 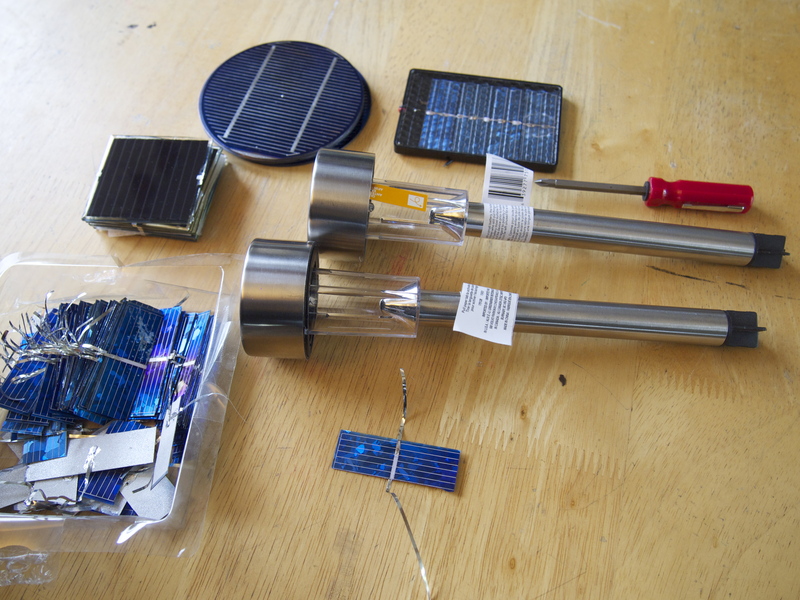 Instead of shrink-wrapped batteries, they use AA packs, and a DC motor with a bit of hot melt glue stick on the shaft to provide the rotation. The teens built them very quickly after a brief demonstration, and went on to modify them in some festive and creative ways. After they had them running, I gave out some LEDs, which they incorporated into the circuit. This altered the speed of the motor, which brought us back to the white board to explore what influence the LED was having on the motor. One of the guys found that he could hold onto the glue, causing the cup to spin in front of his mouth. This caused an effect similar to older models of electric organs that used a Leslie Speaker. Other options that were explored included varying the amount of glue stick on the motor, changing the direction of the electricity flow, attaching pens to the cups, and modifying the cups. At the end of the workshop, everybody was able to take their projects home for further exploration.